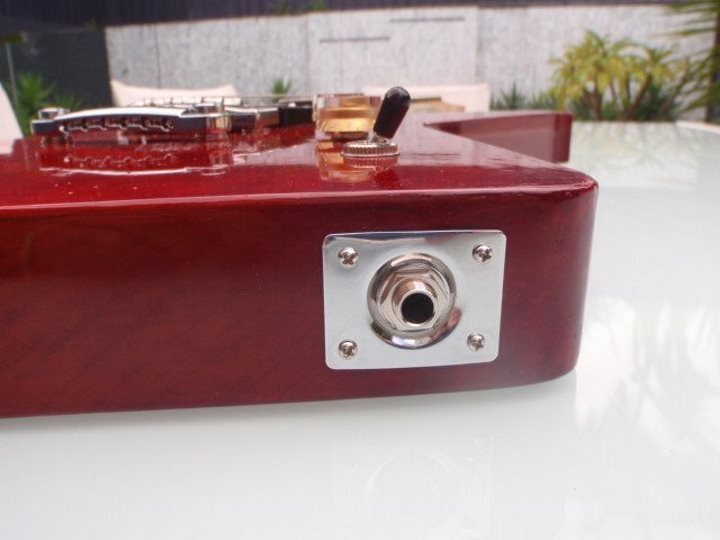 ProjectGuitar.com's Guitar Of The Month contest is a showcase for all members to exhibit their creations and to vote on their favourites from each other's builds. The contest is open entry for any and all members. The winner(s) receive a featured article placement at the top of the ProjectGuitar.com homepage, default site background wallpaper and privileged member perks across the site (plus a shiny member badge in the forums!). 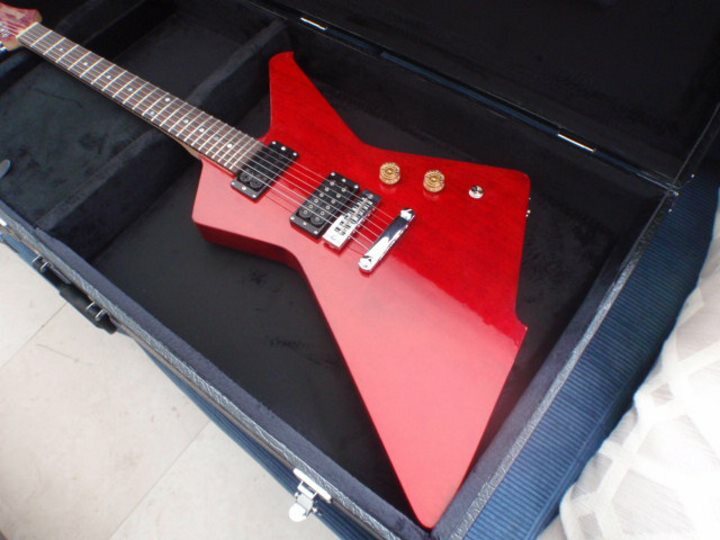 The main ProjectGuitar.com site sees thousands of unique visitors from around the Internet so show off your work for the world to see! Submissions are open throughout the month until about the last week when public voting opens. Polls close at the tick of midnight on the 1st of each month. !!NEW!! Lastly, if you didn't win a previous month's Guitar Of The Month contest, you are encouraged to enter your build again the next month for a maximum of three consecutive months. Sometimes one entry in a month really hits it out of the park! 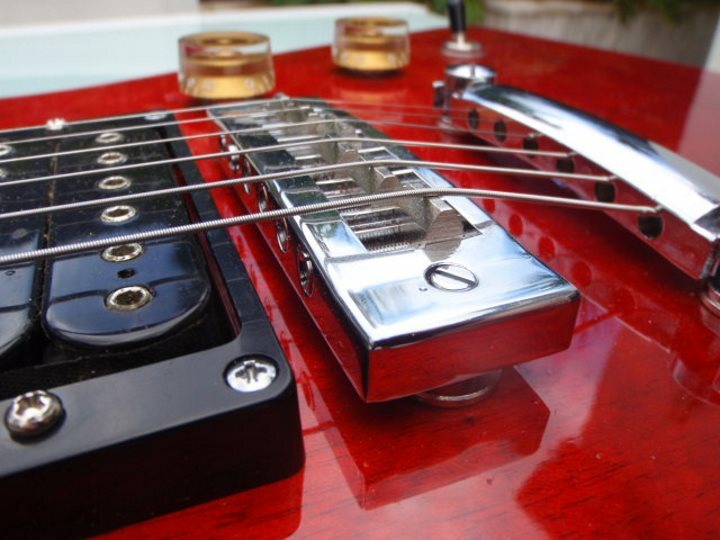 Post a maximum of four eight of your best photos for each guitar entered. A bit of information on your background as a builder helps give context to your build. Knowing whose build is a "first-timer" and those of highly experienced builders can change a voter's mind in the contest. Was it built in the garage, at school, work or in your own shop? A summary of the build's history. Was it built for yourself, friend/family or a client? 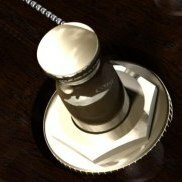 Did you design the instrument and its specifications or was it built to spec? What were the inspirations behind the instrument and why were various build aspects chosen? Any background on what makes it special, etc. Tell us more about the instrument! Posting a link to your guitar-building website, Photobucket, Facebook, etc. is fine, even if it is your business. In the spirit of fairness we encourage instruments made by seasoned builders to have that disclosure made so there is a more even balance between weekend warriors and grizzled veterans. If you documented your build in the forums, post a link to the thread! Instruments with a build thread tend to attract more votes from the general community. If you are unable to link/post photographs or have any other questions about the GOTM contest, either PM me or ask forum members; we're a helpful bunch! 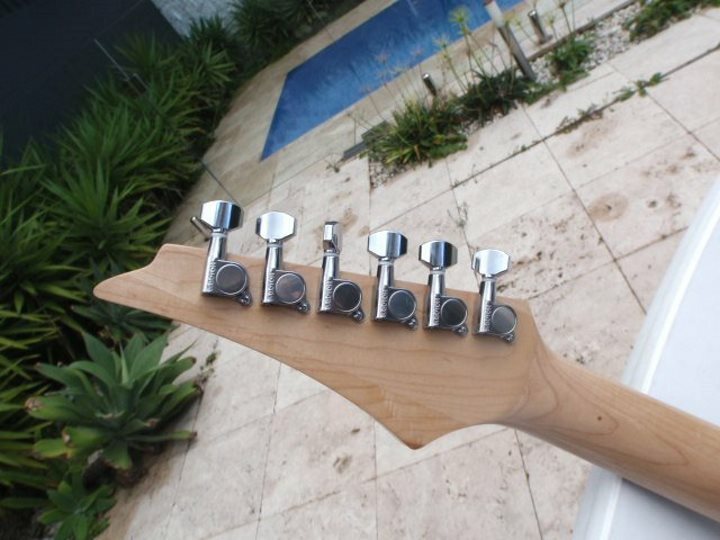 In general it is recommended to upload your photos into ProjectGuitar.com Gallery and inserting them using the "My Media" button in the post editor. This is a scaled down version of my EvenStar acoustic guitar. It is based around the work of Kasha/Schneider and uses an adaptation of their bracing pattern and a somewhat more "normal" bridge. The back and side wood is Bloodwood, the top is Sitka Spruce, the neck maple and the fretboard, bridge and sound hole ring is all bloodwood. Bindings, end graft and heel cap is red sparkling celluloid. The scale is almost exactly 21" (actually just a 25" scale chopped of at the third fret). The guitar is finished in tung oil and rubbed down with steel wool to create a matte satin sheen. I had a customer ask me to do a small spaceman inlay on the 12th fret. I said that it'd be no problem, however I asked why he wanted a spaceman and if there was any meaning to it (so I could get it right, make it personal to him), he said he had an interest in all things space related and sent me pics of his tattooed arm sleeves which were covered in space related scenery, so I then suggested he go all out on the board and match the inlay to his sleeves in theme and he loved the idea. The "Space Scene" was born. There is just under 200 planet inlays on this board, approx 150 of them being the small stars. The fingerboard inlay materials include: Rosewood, Cocobolo, Bocote, Black Limba, Paua shell, Black Mother of Pearl, Gold mother of Pearl, Abalone, White Mother of Pearl, Malachite, Brass & plastic. African Walnut top, Flamed Maple center over African Mahogany with Rosewood stringers and Ash back. I am a hobby builder and this is my third complete build, I like using hand tools as much as possible, I like the peace and quite of working that way. The plans started out as a tracing of my friends Destroyer body that he bought on ebay. I drew all the plans from there on using a longer scale. The 80's Destroyers had a harmonica bridge, so I decided to use one on this build. I made my own mitre box to cut the fret slots. 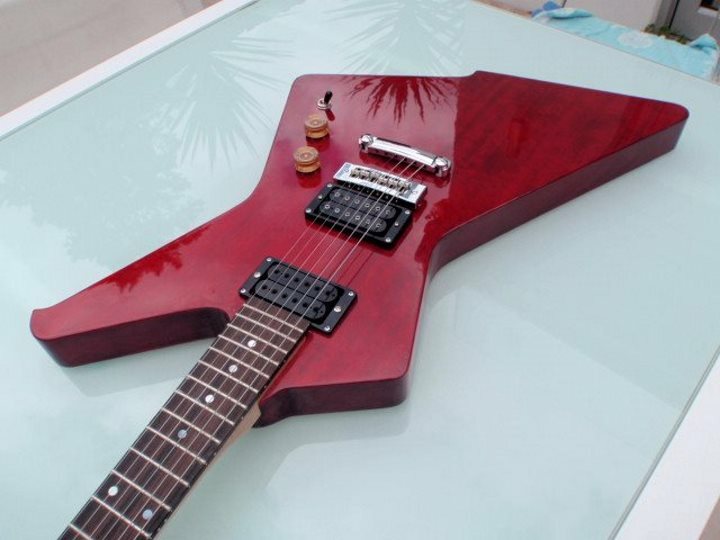 The guitar was built in my basement (for the noisy parts) and in the back garden under a sun shade on a little fold out work table with a piece of mdf on the top. This was the first lean back headstock that I have made and my first go at a scarf joint. I made a jig to cut the scarf joint at the right angle. 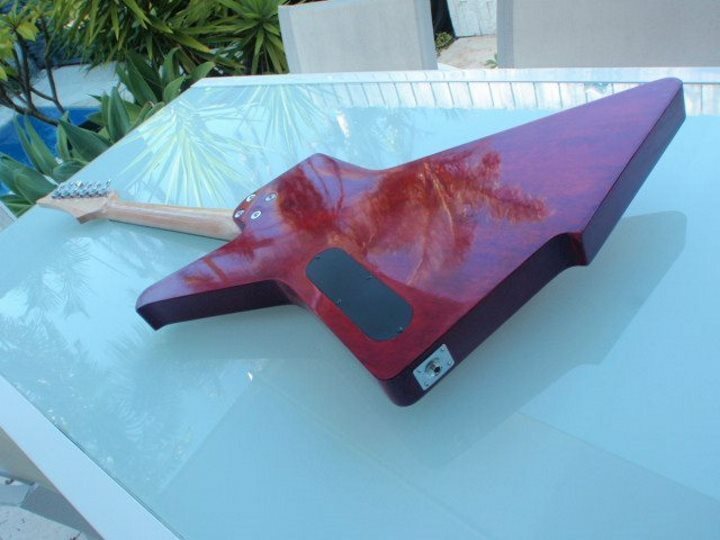 This guitar was built for me to play, I have always loved the 1980's red Destroyers (I am a big Iron Maiden fan) but I wished that they had been made with wood grain showing rather than a solid paint cover, so decided to give that idea a go, with Cherry Red stain from Stew Mac. 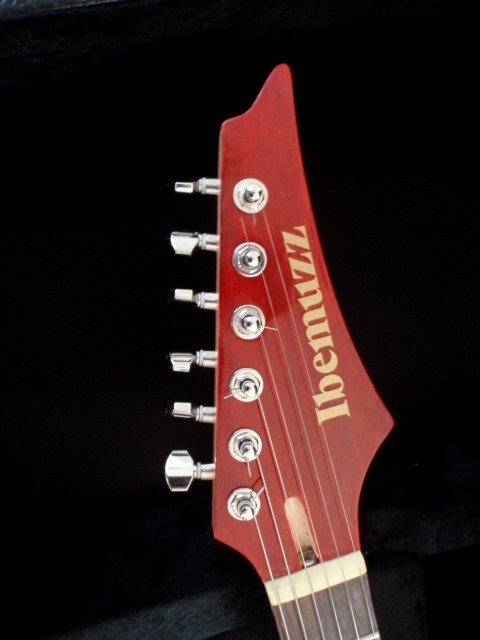 The headstock is obviously modelled on the Ibanez design, I drew the modified shape longer and with a slightly different curve and made the template for my first full build and used the template again in this one. 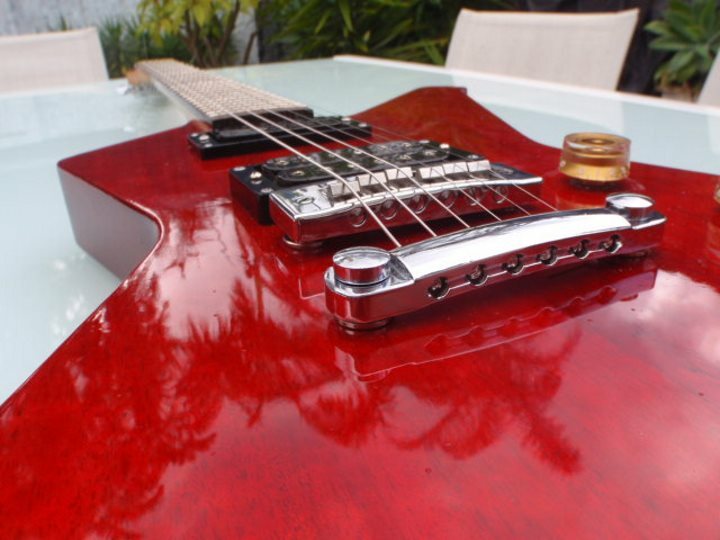 The finish is Rustins Plastic Coating, the same stuff that is on Brian May's Red Special. I used long neck pots so that I could leave more wood on top of the control cavity, the 3 way switch is counter sunk in.